Pretty bad form to start a blog and disappear, right? Oh well, my only excuse is computer problems, hopefully all fixed now. So, since then, you ask? In the pottery world I attended the Mt Mitchell Craft fair. 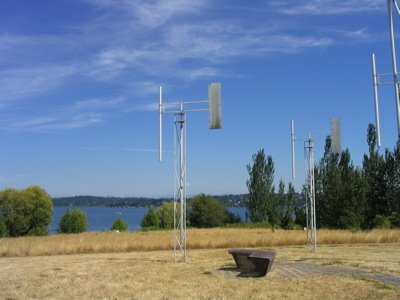 It's always hot there, but this year it set a new precedent for miserably hot. I've gotten back in the studio today for the first time in a month. Nice to be back. I've got lots of special orders to work on in addition to all the inventory I need for my next show and to get the shops stocked for October. That next show is the very first, maybe annual, Old English Inn invitational Pottery Show and Sale. That will be in Spruce Pine Oct 14-15. Also in October I will be one of the featured artists along with my friend and fiber artists Cedar Johnson at Toe River Crafts in Celo. I'll post some pottery photos in a few days, I threw a couple of lamps that might work out well enough to show off. In the knitting world I've been ignoring the new neck project that I mentioned in the last post. I'll get to it. I've been distracted by socks. I've finished two socks this week. unfortunately they both need mates. I'm making progress on that too. As soon as I'm done with those, I've got a few project to finish up, the previously mentioned top, a cashmere blend sweater that's been waiting since last fall, and I've been dreaming of a skirt in a really cool yarn that I've found. I've got a ball to swatch and play with. We'll see how that goes. Otherwise, we spent a great week in Washington state visiting friends, setting up a pottery studio, and being tourists. I took about 150 photos (unheard of for me) but just one for now. 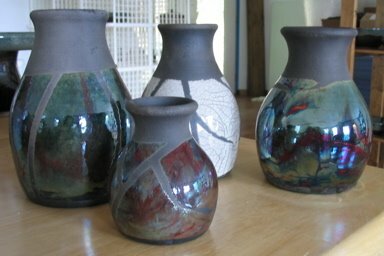 When we got back Wildacres need a pottery teacher on short notice so Mom and I filled in and taught a week long Raku class. Here are a few of the pieces I made as examples for the class. I'm so glad to see you have a blog and am excited that you KNIT too! I am also a knitting addict. Do you sell the Raku? 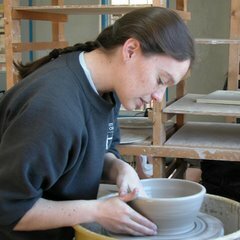 Remember, we have your pottery in our shop here in Indiana. The Loft Art Gallery which used to be Market Street Studio. Nice Socks! 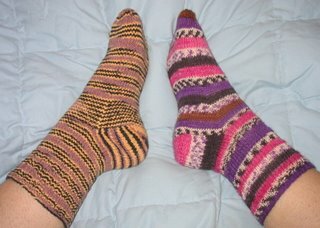 I love making socks too, just wish I could do two at a time.